This jack rafter calculator works in any situation every time. Simply use the drop down to enter the pitch of the main roof, the pitch of the complimentary roof, and the length of the long rafter to get reliable results. For any questions, see the directions at the bottom. The only method that is 100% foolproof to find the values for all jack rafters, no matter what the pitch or even if they are on different pitches is to physically measure the long rafter and the short rafter and then divide the difference by the number of spaces. This calculator returns the first 16 jack rafters. If more are needed, then simply start over by entering the last measurement in the longest jack rafter field. 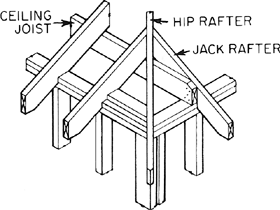 Know that the basic skeleton for the roof has to be erected before any jack rafters can be installed. Use the hip roof calculator for an easier way to get started. The first step is to enter the length of the longest jack rafter. The top of this calculator has three fields labeled “Feet”, “Inches”, and “Fraction”. You can use all three fields, the inches and fraction, or the inches fields. The inches field will accept decimal values for those familiar with decimal values. It can be slightly faster to enter “311.5” in the inches box besides entering “25” in the feet box, “11” in the inches box, and selecting “1/2” in the fraction drop down. Either way produces the same results. Next select a the pitch the jack rafter is on. It is also necessary to select the pitch of the complimentary roof. This is the adjacent roof that will share the hip or valley. Most of the times it is the same as the pitch the jack rafter is on. If it is not the same it does not matter to this calculator. Just remember if it is different, then the measurements of the rafters will be different and will have to be handled by repeating the steps for this side. Knowing this, 17 results are automatically generated below. The first one is the bevel of jack rafter. This is the angle in degrees to set the circular saw you should be using to cut the rafters. As long as the roof pitches are the same, then the bevel will always be 45º. If the pitches are different, then the bevels will be different. Most modern saws will adjust up to a 55º. Anything over that presents several options for making the cuts fit proper into the hip or valley. If you are not familiar with these methods, then you may be better off to leave the bevel alone and just cut the rafter square. The next 16 are the lengths of the jack rafters in inches and fractions. It simply slowed the calculator down too much to generate feet and inches. It is traditional for most farming carpenters to use inches only on jack rafters anyway. The results are automatically generated for 16 rafters. If there are not that many rafters then the results are displayed as negative numbers and should be simply ignored.